Penguins (order Sphenisciformes, family Spheniscidae) are a group of aquatic, flightless birds. They live almost exclusively in the Southern Hemisphere, with only one species, the Galapagos penguin, found north of the equator. Highly adapted for life in the water, penguins have countershaded dark and white plumage, and their wings have evolved into flippers. Most penguins feed on krill, fish, squid and other forms of sea life caught while swimming underwater. They spend about half of their lives on land and half in the oceans. 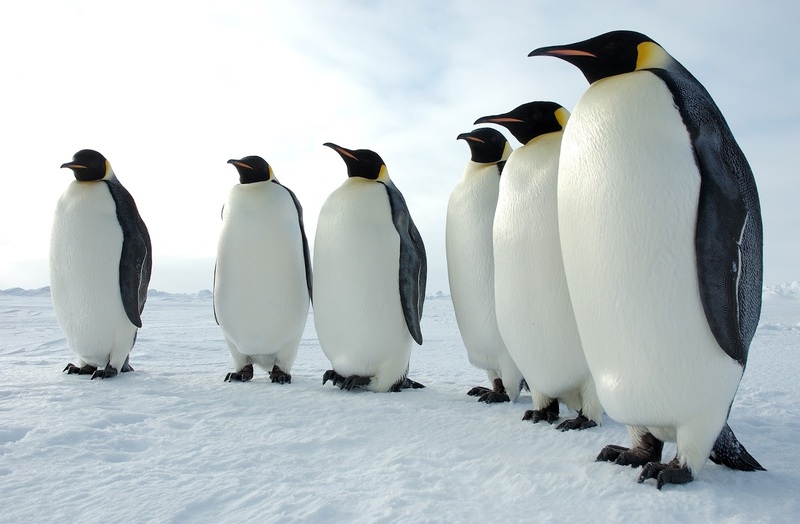 The largest living species is the emperor penguin (Aptenodytes forsteri):on average, adults are about 1.1 m (3 ft 7 in) tall and weigh 35 kg (77 lb). The smallest penguin species is the little blue penguin (Eudyptula minor), also known as the fairy penguin, which stands around 40 cm (16 in) tall and weighs 1 kg (2.2 lb). Among extant penguins, larger penguins inhabit colder regions, while smaller penguins are generally found in temperate or even tropical climates (see also Bergmann's rule). Some prehistoric species attained enormous sizes, becoming as tall or as heavy as an adult human. These were not restricted to Antarctic regions; on the contrary, subantarctic regions harboured high diversity, and at least one giant penguin occurred in a region around 2,000 km south of the equator 35 mya, in a climate decidedly warmer than today. The evolutionary history of penguins is well-researched and represents a showcase of evolutionary biogeography; though as penguin bones of any one species vary much in size and few good specimens are known, the alpha taxonomy of many prehistoric forms still leaves much to be desired. Some seminal articles about penguin prehistory have been published since 2005; the evolution of the living genera can be considered resolved by now. Penguins have a thick layer of insulating feathers that keeps them warm in water (heat loss in water is much greater than in air). The emperor penguin has the largest body mass of all penguins, which further reduces relative surface area and heat loss. They also are able to control blood flow to their extremities, reducing the amount of blood that gets cold, but still keeping the extremities from freezing. In the extreme cold of the Antarctic winter, the females are at sea fishing for food leaving the males to brave the weather by themselves. They often huddle together to keep warm and rotate positions to make sure that each penguin gets a turn in the center of the heat pack. Calculations of the heat loss and retention ability of marine endotherms suggest that most extant penguins are too small to survive in such cold environments. In 2007, Thomas and Fordyce wrote about the "heterothermic loophole" that penguins utilize in order to survive in Antarctica. All extant penguins, even those that live in warmer climates, have a counter-current heat exchanger called the humeral plexus. The flippers of penguins have at least three branches of the axillary artery, which allows cold blood to be heated by blood that has already been warmed and limits heat loss from the flippers. This system allows penguins to efficiently use their body heat and explains why such small animals can survive in the extreme cold.